One of the great achievements of Post-Normal Science after the Second World War was the establishment of Radiocarbon Dating as academically acceptable Settled Science. This accomplishment was strategically initiated by Willard Libby when he asked for mainstream assistance with the validation of his pioneering Radiocarbon Dating technique. The next step was to try the dating method. Dr J.R, Arnold of Princeton joined us for this test. He was a physical chemist as were both Dr Anderson and I, but his father, a lawyer, was an enthusiastic amateur archaeologist and this brought him to us in the proper mood. We worried about this a great deal and finally decided there was nothing for it but to enlist the aid of recognized experts to advise us and acquire the materials for us. So we appealed to the American Archaeological Association and the Geological Society of America to give us a committee of experts which they did. The mainstream response was to form a formidable committee of Four Just Men [“three archaeologists and one geologist”] to assist Willard Libby. He attended Yale University and taught at the University of Alaska (1935-1942), specializing in Alaskan prehistory…. After the war he was appointed U.S. Commissioner for the Rhine and faced with the daunting task of rebuilding Ruhr coal industry. Later he worked as an archaeologist at the University of Pennsylvania, eventually becoming director of the University of Pennsylvania Museum. He hosted the popular television show, “What in the World?”, which was aimed at stumping experts as the analyzed archaeological artifacts. An archaeologist, ethnologist and museologist. Collier was the chairman of the Institute of Andean Research, a founding trustee of the Council on Museum Anthropology, and served as president for the Central States Anthropological Society. Flint graduated from the University of Chicago and earned his Ph.D. in geology at the University of California graduating in 1925. He then joined Yale as a member of the faculty, becoming a full professor in 1945. Flint was recognized for his leadership role in Quaternary period geology with extensive work on effects of glaciations in northeastern America. 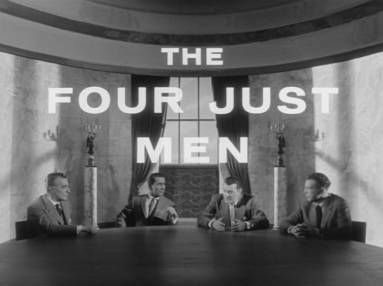 The Four Just Men was a 1959 Sapphire Films production for ITC Entertainment. At this stage Willard Libby knew he faced a formidable force. Therefore, following a path of least resistance, Libby worked towards a marriage of convenience that would give scientific credibility to mainstream archaeology in return for mainstream acceptance of his Radiocarbon Dating technique. These distinguished gentlemen worked hard for several years, assisting and collecting the samples and advising us. The research in the development of the dating technique consisted of two stages – the historical and the prehistorical epochs. The first shock Dr. Arnold and I had was when our advisors informed us that history extended back only to 5,000 years. 30,000 years, put the points in, and then our work would be finished. You read statements in books that such and such a society or archeological site is 20,000 years old. We learned rather abruptly that these numbers, these ancient ages, are not known accurately; in fact, it is at about the time of the First Dynasty in Egypt that the first historical date of any real certainty has been established. So we had, in the initial stages, the opportunity to check against knowns, principally Egyptian artifacts, and in the second stage we had to go into the great wilderness of prehistory to see whether there were elements of internal consistency which would lead one to believe that the method was sound or not. The first step in the courtship was the creation of a Curve of Knowns based upon the Radiocarbon Dating of a range of artefacts previously dated by the mainstream. They immediately directed us to the Breasted Egyptian collection in the Oriental Institute at the University of Chicago and to John Wilson, a senior professor in the Institute. Through Professor Wilson we obtained precious materials from the earliest pyramids and proceeded to burn and date them. Fig. 3 shows the Curve of Knowns – the results obtained for samples of known age compared to the carbon-14 decay curve drawn from the present living matter value of 14 taken as unity, with a half-life of 5,568 ±30 years. The oldest samples of known age measured were Hemaka and Zet from the First Dynasty in Egypt. Both were wood found in the subterranean brick structures of the First Dynasty tombs of the Vizier Hemaka and of King Zet, both at Saqqara. Hemaka was contemporaneous with King Udimu, and both tombs were generally agreed to be 4,900 ± 200 years before the present. The next oldest samples were cedar wood from the upper chamber of the Southern Pyramid of Sneferu at Dahshur. The next sample marked Sesostris is a very interesting one. It is a part of the deck of the funeral ship which was placed in the tomb of Sesostris III of Egypt and is now in the Chicago Museum of Natural History. It is about 20 feet long, 6 feet wide, and is quite an imposing object, complete with paddles. Our sample came from the deck. The next sample is Aha-nakht. It consisted of wood, probably cedar from the outer sarcophagus of Aha-nakht, at El Bersheh. It was found in the tomb which was covered with earth. The coffin was presumably excavated by the natives at the same time as the El Bersheh coffin obtained for the British Museum by E. A. W. Budge after 1895. Proceeding up the curve, the next sample is the heartwood of one of the largest redwood trees ever cut. The tree was known as the “Centennia Stump” felled in 1874 with 2,905 rings between the innermost (and 2,802 rings between the outermost) portion of the sample and the outside of the tree. Therefore, the known mean age, according to the tree-ring method of Douglas was 2,928 ± 51 years, as of the time it was cut. This is an interesting point, as it shows that in the heartwood of the Sequoia gigantea at least the sap is not in chemical equilibrium with the cellulose and other large molecules of the tree. In other words, the carbon in the central wood was deposited there about 3,000 years ago, although the tree itself was cut just a few years ago. The next sample, which is marked Tayinat, is from a house in Asia Minor which was burned in 675 B.C. It was wood from the floor of a central room in a large Hilani (“Palace” of the “Syro-Hittite” period in the city of Tayinat in Northwest Persia. Its known age is 2,625 ± 50 years. The next is the linen wrapping of one of the Dead Sea Scrolls, the Book of Isaiah, which was found in Palestine a few years ago. The next sample, labeled “Pompeii”, was carbonized bread from a house of ancient Pompeii still retaining the appearance of a baker’s roll that seemingly was overdone, which was charred by the volcanic ashes that buried the city in 79 A.D., roughly 1880 years ago. The other samples are wood which were dated by the Douglas tree-ring counting technique. Taking these samples all together, the agreement with the predicted radiocarbon content seems to be satisfactory. The errors are given as the counting errors (standard deviations) only. Although this first step was deemed “satisfactory” there were some nail biting moments. The earliest experience on ancient matter obtained by the author was with Egyptian material from the Oriental Institute at the University of Chicago, and the first measurement gave a satisfactory date. However, the second measurement gave the supposedly Egyptian sample a modern age or zero age. This was puzzling until it was learned with great relief that there was indeed a possibility that the material was modern. Fortunately this happened very seldom, as otherwise faith in radiocarbon dating would have been rapidly shaken and the research abandoned (once again good luck held!). The second step in the courtship was to see if the Radiocarbon Dating of prehistory was “reasonable”. Following the test of the Curve of Knowns, the next step in the research was to test in the great periods of prehistory to see whether the dates obtained were reasonable. Perhaps the most interesting single general result in this prehistoric period is the time at which the last ice sheet moved down to cover the northern part of the United States and the European continent. The result 11,400 years ± 200 years has now been well established by the radiocarbon technique; i.e. the radiocarbon dates for this cataclysmic development show first that it happened simultaneously in Europe and in North America and that the phenomenon was very widespread, and that it had a tremendous impact on the living habits of the people the world over; e.g., the oldest sign of man in Northern Europe and in England is younger than this, presumably because of the thoroughness with which the glacier removes all sorts of human artifacts. So the oldest of the Scandinavian and English occupation sites, all are about 10,400 years, corresponding presumably to the time when the ice sheet receded. In Fig. 6, we have plotted for the Americas just the number of occupation sites versus age measured by radiocarbon. It is quite clear that there is an abrupt discontinuity at about the time of 10,400 years. In Europe, however, if instead of examining sites in northern regions we look at Mediterranean basin sites, there is no discontinuity, and evidences of human occupation extend back as far as the radiocarbon dating technique can reach – 50,000 years or so. The third step in the courtship was successfully manoeuvred when Libby demonstrated that it was possible to clean samples so that multiple artefacts [from a single site] gave consistent results. Thus a technique was developed for cleaning samples and authenticating them, which involved mechanical washing followed by chemical treatments to remove contaminants such as humic acids from soil and calcium carbonate from limestone, etc. The proof of the adequacy of these techniques necessarily lay in finding the same age for a given site with a variety of materials. Thus it was gratifying to observe that on the Two Creeks Forest bed in Wisconsin, made during the last glacial advance, the peat in the soil gave the same date as large pieces of wood from the trees that had been felled by the southward moving glacier as it advanced some 11,400 years ago (Table III). Similar tests in other sites and contexts showed that it is indeed possible to find matter containing carbon clean enough and authentic enough to give reliable radiocarbon dates. Libby then gathered momentum when oceanography “yielded” to Radiocarbon Dating. In oceanography, the great question of the rate of mixing of the oceans has yielded to the radiocarbon technique to a considerable extent, particularly in the hands of Suess and Broecker and Olson; Suess particularly in the Pacific, and Olson and Broecker in the Atlantic. They have shown that the Pacific mixes relatively less rapidly, the turnover time being something between 1,500 and 2,000 years; whereas, the Atlantic mixes relatively more rapidly at a rate about twice this, or with a 750- to 1,000-year turnover time. Unfortunately, for Libby, he found dendrochronology was a far harder nut to crack. The bristlecone pine tree ring chronology of Fergusson & Bannister has made possible the determination of the extent of the deviations of the radiocarbon dates by Suess, Ralph & Damon back to some 7500 years ago. The dates appear to start falling slightly too young about 3000 years ago and continue deviating in that sense until what may be the peak deviation of some 700 years is reached about 5000 years ago. The deviation then appears to level off. There is some evidence of a decrease in the variation back toward agreement at 10,000 to 11,000 years. This evidence is from the Swedish varve chronology, according to Tauber and others. In addition to the broad general sweep of the main deviation there appears to be a short-term fine structure of somewhat erratic nature, according to Suess. However, a rather crestfallen Libby finally consummated his marriage of convenience with the mainstream when he accepted the correction curve [aka calibration curve] proposed by the dendrochronologists. As the method has been perfected, and accuracies have increased, it has been discovered, as might have been anticipated, that there are significant deviations between radiocarbon dates and the true dates, but during the early years good checks were found by the author’s group, since the measurement errors gave dates accurate to only two centuries or so (plus or minus 100 yr). Apparently, and fortunately, the deviations are normally small in the periods of recorded history, being of the order of 1 or 2% in radiocarbon content (1% is 80yr). A curve of correction has been published by Suess and others which can be used to about three thousand years ago to give results which are apparently fully concordant. The existence of continuous tree-ring chronologies extending back in time over several millennia has made it possible to calibrate the radiocarbon time scale (eg Pearson et al 1986). Since the production of 14C in the atmosphere is not constant, contrary to the initial assumptions underlying 14C dating, radiocarbon determinations must be calibrated relative to the radiocarbon content of wood samples of known age. There are several calibration curves that can be used to calibrate radiocarbon results. These are described in special calibration editions of the journal Radiocarbon (1986: vol 28, part 2A; 1993: vol 35, part 1). Calibrated radiocarbon results can be used to date timbers where tree-ring dating has proved unsuccessful. Wood samples, containing several annual rings, are taken at known intervals (usually of 10 or 20 years) from the timber to be dated and submitted for high-precision radiocarbon dating. The radiocarbon results are then used to replicate a portion of the calibration curve, which is fixed in calendrical time, by ‘wiggle-matching’ against the known age calibration data (Bronk Ramsey 1995). This method can result in the production of very precise dates (see, for example, Pearson 1986, and Hillam et al 1990). These should be quoted as ‘cal BC’ or ‘cal AD’, since they rely on radiocarbon determinations, and to distinguish them from absolute dates derived from historical sources and dendrochronology, which are expressed as ‘BC’ or ‘AD’. Gallery | This entry was posted in Catastrophism, Dendrochronology, Earth, Radiocarbon Dating, Science. Bookmark the permalink.